Hatters captain Johnny Mullins was determined to take the positives from his side’s 3-1 defeat to Premier League side Newcastle United in the FA Cup on Saturday. The Luton skipper and his team-mates had been staring down the barrel of a heavy defeat at half time, conceding three times in the space of nine minutes. You’ve got to look at the second half as it’s day that although we’ve lost, there’s positives to be taken. However, they recovered to have a real go in the second period, with Danny Hylton’s 17th of the season scant consolation for their efforts. He said: “The experience was great, we started the game in a good fashion, they’re obviously Premier League quality, but a nine, 10 minute period has taken the game away from us. “They’ve got unbelievable quality which we knew, and we can’t aid and give them goals, which we have done unfortunately. “But I thought the response from those goals with the second half performance was really good and there are plenty of positives to be taken out of it. “We won the second half, it was a real great experience to play in, the surface, the crowd, I thought our fans were unbelievable as they always are. After swapping ends 3-0 behind, Mullins knew that they had to approach the second period in a different manner to avoid being handed a thumping defeat. He continued: “We spoke about that half time, we’ve done that to a few teams and we know what they could have then done. “So we had to adjust slightly second half, approach the game in a slightly different fashion and try to build into it, which we did. “We didn’t want to come out and get turned over fours and fives, we stepped into the game. “We got the goal, scored a second which wasn’t offside, and then you never know. “We caused them problems, we’ve got players who can cause them problems. “Harry Cornick came on, gave us a real different dimension, and if the second one’s given, which it should have been, then who knows? “But they’re a quality side and when you give them half an opportunity, they’ll take it. The manner of the first goal was a cause of frustration for Mullins too, with keeper Marek Stech dropping Jacob Murphy’s free kick, allowing Ayoze Perez to score. 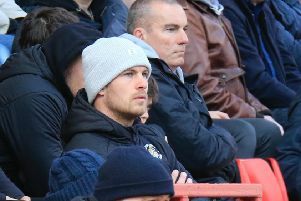 The centre half admitted boss Nathan Jones hadn’t been happy with what he witnessed in the first period, and made it clear to the players during the interval, saying: “It was disappointing and the gaffer told us at half time. “We’d flagged up what they can do prior and they did it, that happens. “They’re a quality side and mistakes happen, that’s part and parcel of football. Mullins was alongside Glen Rea at the back with Alan Sheehan suspended and on the new-look partnership, he added: “I think Glen’s been brilliant all season. “He’s a real top pro, works his socks off and I thought he was excellent. “We’ve got two out (Sheehan and Scott Cuthbert) and another one steps in.